Space, as one of the classic seven elements of art, refers to the distances or areas around, between, and within components of a piece. Space can be positive or negative, open or closed, shallow or deep, and two-dimensional or three-dimensional. Sometimes space isn't explicitly presented within a piece, but the illusion of it is. The American architect Frank Lloyd Wright once said that "Space is the breath of art." What Wright meant was that unlike many of the other elements of art, space is found in nearly every piece of art created. Painters imply space, photographers capture space, sculptors rely on space and form, and architects build space. It is a fundamental element in each of the visual arts. Space gives the viewer a reference for interpreting an artwork. For instance, you may draw one object larger than another to imply that it is closer to the viewer. Likewise, a piece of environmental art may be installed in a way that leads the viewer through space. In his 1948 painting Christina's World, Andrew Wyeth contrasted the wide spaces of an isolated farmstead with a woman reaching towards it. French artist Henri Matisse used flat colors to create spaces in his Red Room (Harmony in Red), 1908. 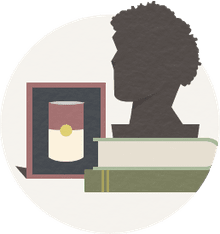 Art historians use the term positive space to refer to the subject of the piece itself—the flower vase in a painting or the structure of a sculpture. Negative space refers to the empty spaces the artist has created around, between, and within the subjects. Quite often, we think of positive as being light and negative as being dark. This does not necessarily apply to every piece of art. For example, you might paint a black cup on a white canvas. We wouldn't necessarily call the cup negative because it is the subject: The black value is negative, but the space of the cup is positive. In three-dimensional art, the negative spaces are typically the open or relatively empty parts of the piece. For example, a metal sculpture may have a hole in the middle, which we would call the negative space. Henry Moore used such spaces in his freeform sculptures such as Recumbent Figure in 1938, and 1952's Helmet Head and Shoulders. In two-dimensional art, negative space can have a great impact. Consider the Chinese style of landscape paintings, which are often simple compositions in black ink that leave vast areas of white. The Ming Dynasty (1368–1644) painter Dai Jin's Landscape in the Style of Yan Wengui and George DeWolfe's 1995 photograph Bamboo and Snow demonstrate the use of negative space. This type of negative space implies a continuation of the scene and adds a certain serenity to the work. Negative space is also a key element in many abstract paintings. Many times a composition is offset to one side or the top or bottom. This can be used to direct the viewer's eye, emphasize a single element of the work, or imply movement, even if the shapes have no particular meaning. Piet Mondrian was a master of the use of space. In his purely abstract pieces, such as 1935's Composition C, his spaces are like panes in a stained glass window. In his 1910 painting Summer Dune in Zeeland, Mondrian uses negative space to carve out an abstracted landscape, and in 1911's Still Life with Gingerpot II, he isolates and defines the negative space of the curved pot by stacked rectangular and linear forms. Creating perspective in art relies on the judicious use of space. In a linear perspective drawing, for instance, artists create the illusion of space to imply that the scene is three-dimensional. They do this by ensuring that some lines stretch to the vanishing point. In a landscape, a tree may be large because it is in the foreground while the mountains in the distance are quite small. Though we know in reality that the tree cannot be larger than the mountain, this use of size gives the scene perspective and develops the impression of space. Likewise, an artist may choose to move the horizon line lower in the picture. The negative space created by the increased amount of sky can add to the perspective and allow the viewer to feel as if they can walk right into the scene. 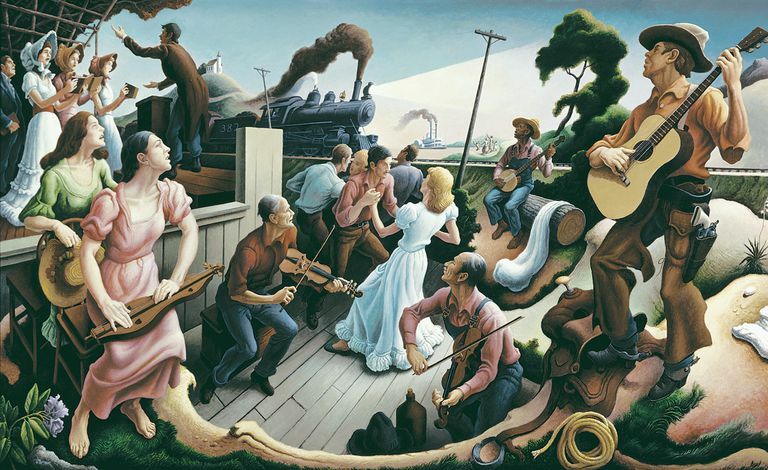 Thomas Hart Benton was particularly good at skewing perspective and space, such as his 1934 painting Homestead, and 1934's Spring Tryout. No matter what the medium is, artists often consider the space that their work will be displayed in as part of the overall visual impact. An artist working in flat mediums can presume that his or her paintings or prints will be hung on the wall. She may not have control over nearby objects but instead may visualize how it will look in the average home or office. She may also design a series that is meant to be displayed together in a particular order. Sculptors, particularly those working on a large scale, will almost always take the installation space into consideration while they work. Is there a tree nearby? Where will the sun be at a particular time of day? How large is the room? Depending on the location, an artist can use the environment to guide her process. Good examples of the use of setting to frame and incorporate negative and positive spaces are public art installations such as Alexander Calder's Flamingo in Chicago and the Louvre Pyramid in Paris. Now that you understand the importance of space in art, look at how it is used by various artists. It can distort reality as we see in the work of M.C. Escher and Salvador Dali. It may also convey emotion, movement, or any other concept the artist wishes to portray. Space is powerful and it is everywhere. It is also quite fascinating to study, so as you view each new piece of art, think about what the artist was trying to say with the use of space.